For cakes and ale at your winter solstice gathering, or for a bit of Yule cheer during the deepest dark and gathering cold, brew up a batch of this seasonal blend. 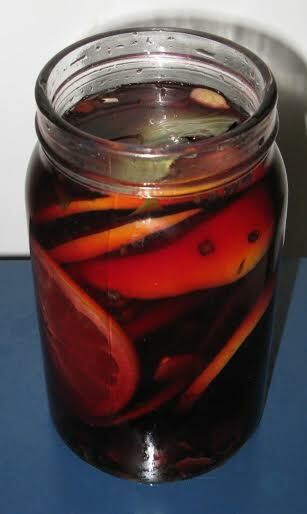 There are many recipes floating around – from wassail to glögg. Some call for wine, others for brandy or sherry, cider or ale, even poet and tea. All use a variety of spices (in addition to what’s below, consider vanilla bean and peppercorns) and fruits (others include raisins, cranberries and lemons). I chose to combine parts of two recipes and ventured out to gather up ingredients. These proportions work when using a quart jar. Place everything in a glass container and shake well. Place in a cool, dark place for two weeks, shaking daily. Some recipes call for letting it sit as long as four weeks. I mixed up mine on a new moon and will strain it on the full moon, then let it continue to sit until Yule. Even a week is a long enough brew time, especially if you simmer it a bit before serving, adding some raw honey if desired.